Rare, forgotten but dangerous: Pathogenic free-living amoebas and their brutal infections in humans. Pathogenic free-living amoebae are found in many natural and human-made microenvironments, mostly living by bacteria feeding. However, in certain situations they can cause serious infections in humans. We are getting closer to the summertime in the northern hemisphere and this is the time of the year that bizarre news regarding Naegleria fowleri can be watched and read in the media. Most popularly known as the “brain-eating amoeba”, N. fowleri can cause a brain infection that is very rare. However, the severity (it kills more than 90% of patients) and fast onset of symptoms (days), leading to death (mostly children), are very disturbing scenarios for the general public. Amoebas of the genus Acanthamoeba also can cause severe infections in humans: a sight-threatening corneal infection called Acanthamoeba keratitis, caused by poor contact lens hygiene, leading to outbreaks in cities around the world. Moreover, Acanthamoeba can cause disseminated infections in immunosuppressed individuals, such as brain, skin, and lung infections. Other amoebas such as Balamuthia mandrillaris and Sappinea diploidea can also cause infections in humans. What are the interesting facts about these amoebas? We can start talking about the formal definition: they are regarded as pathogens not parasites. Pathogenic free-living amoebas (PFLA) can survive without any problem far away from any host. They don’t even need a host to survive. If we look at the definition of a parasite (an organism that lives in or on another organism (its host) and benefits by deriving nutrients at the host’s expense), clearly PFLA are different – or at least a good controversial topic of conversation. The traditional, static terminology above does not accommodate PFLA properly, since they live most or all their time without a host. What are they? Some will say they are not parasites. They are accidental pathogens. In the other hand, PFLA can be a fit for facultative parasites, which are organisms that MAY live in or on another organism and benefits from that interaction. Regardless of the proper definition, PFLA are a good example of how fixed definitions should be updated. N. fowleri naturally lives in warm freshwater bodies, feeding on bacteria until when humans swim in these lakes and ponds and amoebas get – accidentally – in contact with the swimmer’s nose. Then N. fowleri starts a fast journey from the nasal epithelium to the cribriform plate, a porous bone where the olfactory nerves connect with the brain, to finally arrive in that location. In the environment, N. fowleri grazes bacteria. Now these amoebas start to get their nutrients by phagocytosis of nerve cells, destroying the host’s CNS until its death. 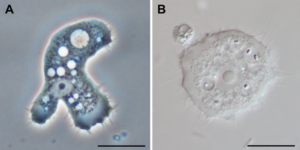 Fast infection, no horizontal transmission, amoebas die after the host death – a very distinct way to interact with the host, when we compare N. fowleri with other parasitic protozoa such as such as Toxoplasma, Plasmodium, and others, which possess complex life cycles and infections that can be chronic. Acanthamoeba spp. is the most common group of amoebas found in the environment. Humans usually possess antibodies against it, indicating that our contact with them is common, without any clear sign of infection. However, if an amoeba falls – accidentally – in a contact lens storage box, which does not have a proper cleaning / disinfecting solution, Acanthamoeba will use the contact lens as a vehicle to access the host’s cornea, and a fast, devastating, destruction of the cornea occurs. Similar traits when compared with N. fowleri? The answer is YES: accidental, fast onset, no horizontal transmission. Despite being accidental and tragic, the infections caused by PFLA are fascinating from a biological perspective. Amoebas that live in lakes, soil and so many diverse environments can have a repertoire of virulence factors ready to act against mammalian immune systems and the accidental host itself. Two interesting examples: Pathogenic N. fowleri can evade innate complement-mediated killing by expressing complement regulatory proteins and by shedding vesicles from its surface when the membrane attack complex binds to the amoeba’s surface. Also, Acanthamoeba species seem to express proteins to bind to specific components of mammalian extracellular matrix (ECM), such as collagen, laminin and fibronectin. These are typical proteins from Metazoans. So why do these amoebas, which are bacterial predators, have such a complex mechanism to evade immune systems and recognize ECM proteins? These are unanswered questions. Another interesting fact about PFLA, specifically Acanthamoeba spp., is its ability to harbor human pathogenic bacteria and work as a reservoir. Legionella pneumophila, the causative agent of Legionaries disease – a type of pneumonia – can be transmitted through human contact with Acanthamoeba, which is commonly found environmental amoeba. L. pneumophila can invade Acanthamoeba and multiply within, causing disruption of the amoeba and release of bacteria. Human contact with water bodies, usually man-made such as air conditioning and irrigation systems, hot springs, and others containing bacteria-infected Acanthamoeba can lead to the spreading of Legionaries disease. Furthermore, bacteria inside amoeba are protected from external stresses such as chlorine, and other disinfection chemicals. Studies to better understand these amoebas are currently ongoing, however funding to study PFLA is scarce. According to the US National Institutes of Health (NIH) Research Portfolio Report, funding of grants spending studying PFLA is approximately 2 million US dollars. Keeping in mind FY2016 NIH budget is 31.3 billion dollars, we can estimate that studies on PFLA are using 0.006% of the NIH budget. Is that enough money? In 2015, five people died of primary amoebic meningoencephalitis, the name of the brain infection caused by N. fowleri. Cases of Acanthamoeba keratitis are sporadic, but outbreaks have been happening in the last ten years. 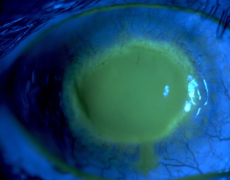 For instance, an outbreak of keratitis in Illinois in 2007 due to a nonfunctional multipurpose cleaning solution led to 138 cases of Acanthamoeba keratitis. It is simplistic to say “few people suffer from these infections, so why fund them?” Obviously a scientific funding portfolio should be carefully made to fund studies on common diseases and infections. However, neglected infections deserve better funding. The infections caused by PFLA are not common, but it is not possible to tell whether they are uncommon because of our lack of studies to quickly detect the infections or because of the accidental nature of transmission. Efficient diagnostic and medical knowledge about these amoebas are critical. More studies – and obviously – more funding are required to advance knowledge against these potential summertime scares. Bruno da Rocha-Azevedo is a Research Scientist at the Dept. of Biophysics at the University of Texas Southwestern Medical Center, in Dallas. He studies the interaction between cells (including pathogens) and components of the extracellular matrix and mammalian cell migration.